This soup will make you cry. Tears of joy? Perhaps. But long before there can be any joyful crying, there will have to be some plain old onion-fumes-in-the-eyes crying. Without a doubt, peeling and slicing six onions will send tears streaming down your cheeks. But, have courage! Brave the fumes! A bowl of this hearty, full-flavored soup is worth every last tear. The great thing about this recipe is that all of its deep, rich flavor comes straight from the onions. This is not soggy, pale onions floating in beef broth. It is onion soup. Before the broth is added, the onions are caramelized and deglazed, caramelized and deglazed, over and over, to create a soup thick with intense onion flavor. And, in case the prospect of hours of careful onion watching doesn't appeal to you, this recipe calls upon your (unwatched) oven to do most of the work. The soup can be made with a traditional beef base, but it's also good with vegetable stock or even water. Most of the flavor comes from the onions, so the vegetarian version has plenty of flavor. The recipe begins with a mountain of sliced onions. The onions spend a few hours in the oven, then they go to the stove top, where they become sticky and sweet and beautifully caramelized. 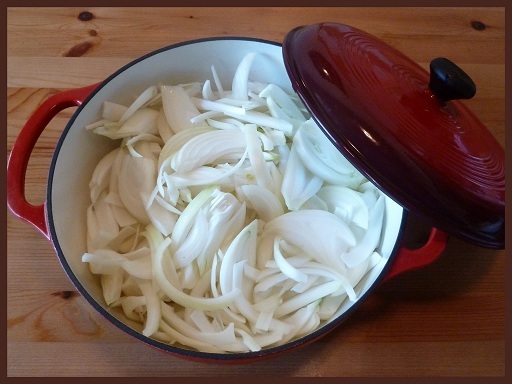 The pot is deglazed multiple times to produce lots of browned onion flavor. Then the onions are simmered with some stock, a splash of sherry, a few sprigs of thyme and a bay leaf. 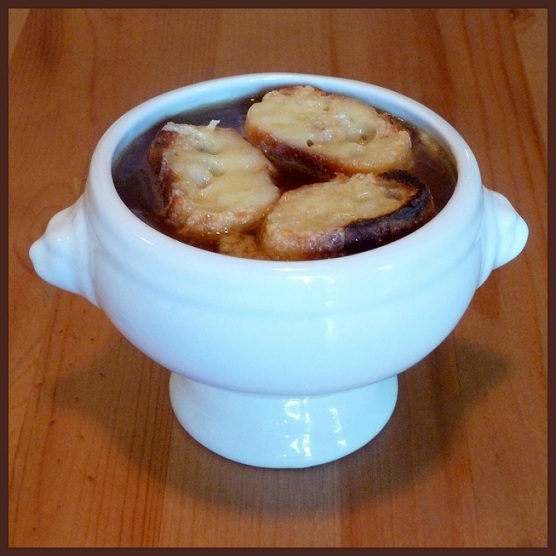 Finally, the soup is poured into crocks and topped with Gruyère croutons. Adapted from Cooks Illustrated , January 2008. Makes 2 quarts, or six big bowls. 6 large yellow onions (about 4 pounds--do not use sweet onions because they will get too sweet and gummy). Preheat the oven to 400 degrees. (The onions are going to be in the oven for several hours, so if you want to cook something else at the same time, like a chicken or a pot roast, you can turn the temperature down to 350 degrees with no problem). Slice the onions. Cut each onion in half, pole to pole. Then cut off the roots and tips, peel away the skin, and cut the onions into quarter-inch slices. It's best to slice them with the grain (pole to pole) instead of against the grain (like onion rings) because this helps them to hold a nice texture--soft strips instead of gooey mush. Put the onions in a a dutch oven with three tablespoons of butter and a teaspoon of kosher salt. Put the lid on and bake for one hour. Then, take the onions out, give them a stir, and put them back in the oven for another hour and thirty minutes, this time with the lid slightly ajar. Stir once after about an hour. The onions will be reduced in size and pale brown in color. Move the dutch oven to a burner on the stove top. Cook the onions over medium-high heat, stirring frequently. The liquid should evaporate after about 15 minutes. When that happens, turn the heat down to medium and continue to cook, stirring and scraping the bottom of the pan until the onions are brown and a dark crust forms on the bottom of the pan. (Keep scraping and scraping the bottom of the pan until the crust on the bottom is so dark and dry that it's difficult to scrape it up and you're worried that it might start to burn). Stir in one one fourth cup of water to deglaze the pan, scraping the bottom and sides until all of the brown bits are mixed in with the onions. Repeat the browning and deglazing process three more times, always letting a dark crust form on the bottom of the pan before adding water. Stay close to the stove or set a timer for one or two minutes at a time so that your onions don't accidentally burn. Finally, brown the onions one final time and then deglaze with one half cup of dry sherry. (The sherry adds acidity to balance out the sweetness of the onions and another nice layer of flavor. If you decide to skip it, deglaze with water and consider adding a dash of mild vinegar). Cook for several minutes, then stir in the chicken and beef broths, two cups of water, and a teaspoon of kosher salt. (You can use all beef broth, but the combination of beef and chicken rounds out the flavor nicely. If you're making a vegetarian version, substitute vegetable broth for the chicken and beef broths). Add the thyme and bay leaf. (Six sprigs of thyme sounded like a lot to me the first time I made this recipe, but it's just the right amount and it's a key flavor in the soup. Be sure to use fresh thyme. You can tie the sprigs together with a piece of kitchen twine or put the thyme and bay leaf into a large tea ball). Turn the heat up to high until the soup begins to bubble gently. Immediately reduce the heat to low and simmer for 30 minutes. Remove and discard the thyme and bay leaf. Season with salt and black pepper to taste. All that remains to be done is to garnish the soup. Cut a baguette into one-half-inch slices. Toast the bread under the broiler very briefly. Then, you have two options. Option one: ladle the soup into broiler-proof crocks. Place the baguette slices on top of each bowl of soup in a single layer. Sprinkle grated cheese over the top and broil for 3-5 minutes until the cheese is melted and bubbly. Option two: figure out how many baguette slices are needed to cover each soup bowl. Arrange the slices on a cookie sheet in close groups, one cluster for each bowl of soup. Sprinkle cheese over the top of each group of bread slices and broil until the cheese is melted and bubbly. Take the cookie sheet out of the oven and let it cool for a few minutes, then use a spatula to transfer each group of cheesy baguette slices (together as one) to the bowls of soup. I like the second option because it's a little bit easier and can accomodate any kind of soup bowl, but putting the little crocks under the broiler can be fun too.